Caprylic Acid Market Value To Reach $4.4 Million By 2022: Grand View Research, Inc. The global caprylic acid market is expected to reach USD 4.4 million by 2022, according to a new report by Grand View Research, Inc. Widespread use of caprylic acid in personal care, and pharmaceutical industry coupled with the growth of these end-use industries is expected to drive growth. Furthermore, growing demand for the acid in manufacturing pesticides and surfactants is expected to propel market growth over the projected period. Pharmaceutical accounted for 17.9% of the overall volume share in 2014. Growing use of caprylic acid in the treatment of yeast infections on account of its anti-microbial and anti-fungal properties is expected to propel demand over the forecast period. Furthermore, rising use of the product for treatment of Crohn’s disease, bladder infections and gingivitis is also expected to drive the market. Personal care accounted for 39.2% of the overall volume share in 2014. Caprylic acid is used extensively in hair care, skin care, and cosmetic products owing to its skin as well as hair conditioning properties. Furthermore, caprylic acid helps acts as an emollient and dispersing agent wherein it helps in the release of pigments and vitamins thereby providing smooth texture to the hair as well as skin. Caprylic acid has profound usage as a natural antimicrobial ingredient for food contact surfaces & equipment, which includes breweries, wineries, and meat processing plants. It helps to maintain proper functioning of the digestive tract and pH balance of the body. Furthermore, this product also activates ghrelin, which stimulates hunger and increases appetite. Market for caprylic acid in food & beverage applications is estimated to be worth USD 1.3 million by 2022. North America market accounted for over 30.0% of the volume and revenue share in 2014. Growing demand for organic personal care products as well as food & beverages is expected to be a key factor driving the market. Caprylic acid is used on food & beverage processing equipment due to its anti-microbial and anti-fungal property. Asia Pacific caprylic acid demand was 118.2 tons in 2014. Personal care segment in Asia Pacific is expected to witness significant growth on account of increasing disposable income and changing consumer preferences towards naturally derived organic products. 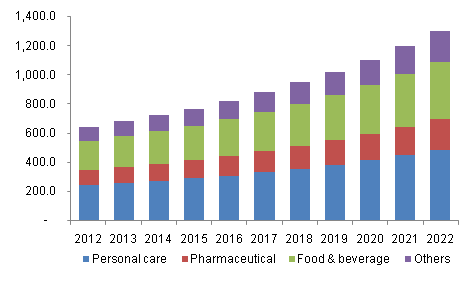 In addition, China pharmaceutical market is expected to witness significant growth on account of the economic & demographic conditions, improved R&D activity and growing health concerns.